As most of you probably know, we recently settled down on the Gold Coast, which just happens to be Australia’s number one holiday destination – and honestly, it does feel like we’re still on a permanent holiday up here. But after traveling around Australia for 18 months, we’re excited to stay put for a while and get to know our new backyard. 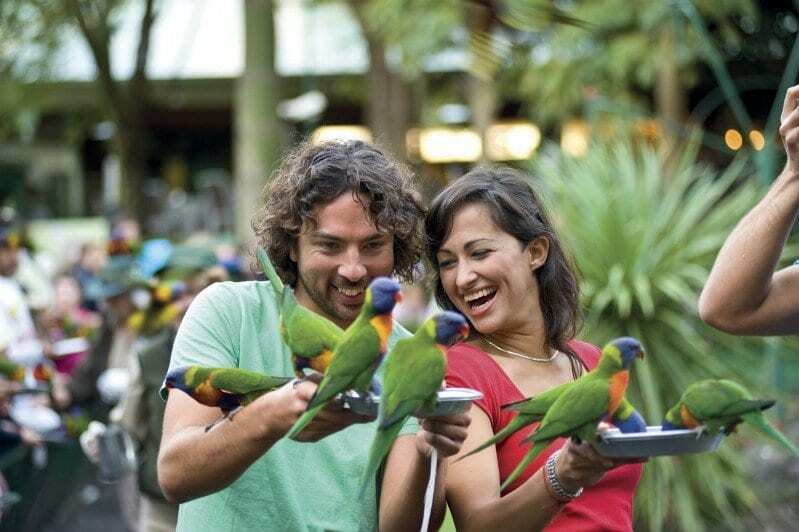 Although we’ve visited the Goldy many times previously, there seems to be endless things to do on the Gold Coast and over the next six months we’re planning on experiencing as many activities as possible. However, there is only one problem with travel in Australia, even travel in your own backyard, it tends to be a little on the expensive side. So this post is a list of things to do for free (or cheap) that we have previously done or are planning to do. So if you’re planning a trip to the coast soon, hopefully these tips will help you save a few bucks, and if’ you’ve already been or happen to live here as well, we’d love to hear your tips in the comments down below! 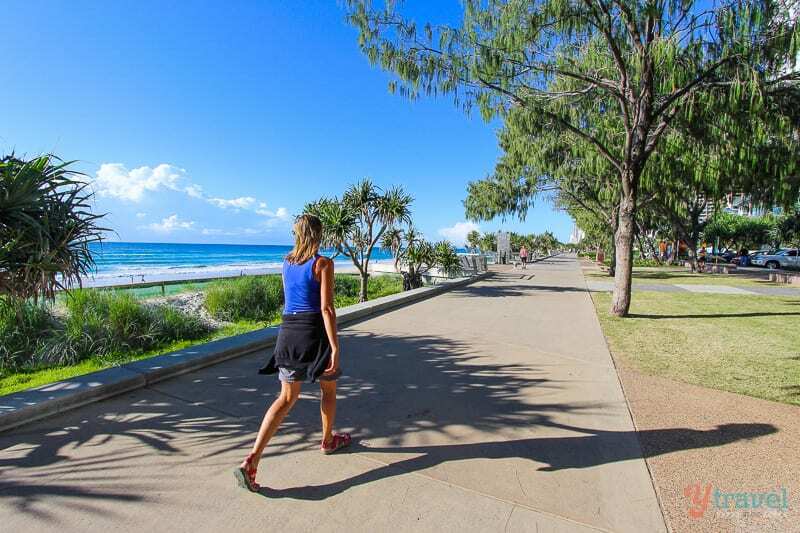 We’ve done parts of The Gold Coast Oceanway, which is a network of pathways along the beaches of the coast which range up to 4km long and are popular with cyclists and walkers. But we’d love to cycle the full length, 36 kilometres in total from Point Danger Lighthouse (Coolangatta) in the south to the Gold Coast Seaway (The Spit) in the north. This would make for a fantastic day out to get some exercise, fresh air, and take in the magnificent coastal views. When you do it, be sure to pack your own lunch, bring plenty of water, your swimmers and a camera. Stop off along the way at any of the beach towns for a dip and a cold drink. Hundreds of rainbow lorikeets descend upon you from the surrounding trees to get a lick at the sweet honey nectar that you hold out in a bowl in your hands. They will climb up your arms, on your head and just sit on your hands drinking. We did this a few years ago and it is worth an hour visit to see these beautiful birds of Australia up close and personal. Walking is free, good for you, and one of our favourite ways to explore a destination. Get up at 6am on the Gold Coast and it feels like midday with everyone out and about walking or running. You can’t help but get caught up in the energy of the place. But you don’t have to drag the kids out of bed at 6am, and it’s not just the coastal area that offers great walking opportunities, the hinterland and National Parks offering lovely walks too! 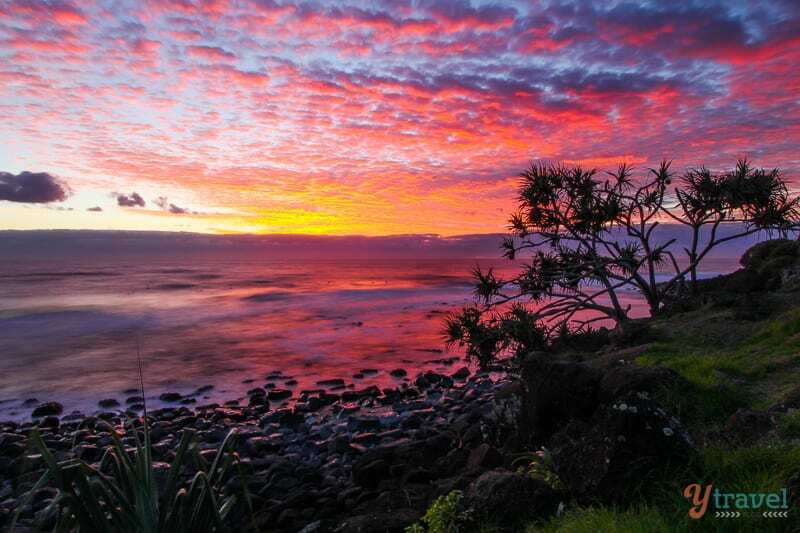 Burleigh Heads National Park – grab a coffee from Nook Espresso then head to the point and catch the magnificent sunrise before doing the 2.5-kilometre coastal walk around the headland to Tallebudgera Creek. About half-way back you’ll come to Tumgun Lookout which offers awesome views over Palm Beach. Federation Walk – a 3.5-kilometre pedestrian walkway located at the northern end of the Gold Coast Oceanway on the Southport Spit. Springbrook National Park – the Purling Brook Falls walking track circuit, the Natural Bridge Rainforest Circuit, Canyon lookouts and Twin Falls walk. Lamington National Park – many fantastic walking trails from short walks to all day hikes. O’Reilly’s Tree Top Walk is 180 metres in length and made up of 9 suspension bridges. Also do the Booyang Boardwalk and Tooloona Creek circuit. 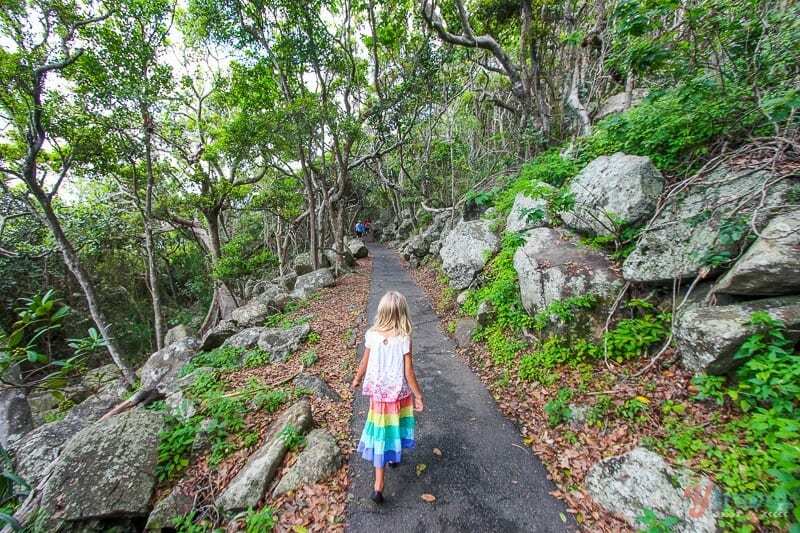 Coolangatta to Point Dangar – a great little coastal walk via Greenmount and Rainbow Bay. I suggest saving it for late afternoon as the sunset views from Rainbow Bay looking over to Surfers Paradise are magical. Tamborine Mountain – is in the third oldest National Park in the world with 12 walking tracks, each one is no longer than 3 kilometres. The Oceanway – instead of cycling walk one of the sections each day. Obvious I know, but is there a better free day out on the Gold Coast than hitting up one of the beaches along the 57 kilometres of pristine coastline?! They don’t call it the Gold Coast and Surfers Paradise for nothing! Not only famous for fun, the Goldy is renowned for their beaches which also happen to be home to some of the world’s most famous surf breaks. But you don’t have to be a surfer or even a water baby to enjoy them, just soak up some sunshine, play on the sand and most of them have grassland, playgrounds, and BBQ areas. Rainbow Bay – Queensland’s most southerly coastal town. Gentle rolling surf, safe swimming conditions and year round surf patrols make Rainbow Bay the perfect place for a relaxing family beach day. And home to “Snapper Rocks” which holds the annual Quiksilver Pro Surfing event. 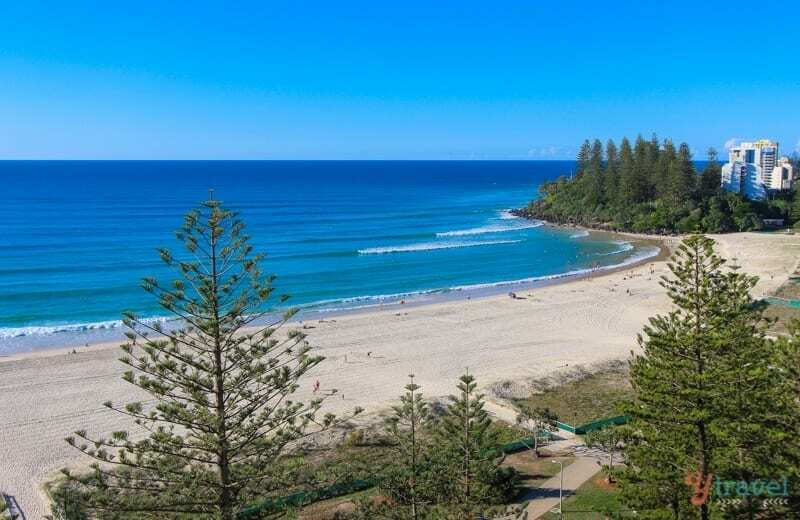 Coolangatta / Greenmount Beach – an 800 m long north facing beach protected by the headland. Generally safe with usually low waves and two surf lifesaving clubs and lifeguard towers. Currumbin / Currumbin Creek – is a popular spot with families where you can enjoy a range of watersports including surfing, kayaking, and stand-up paddle boarding. Tallebudgera Creek – on the southern side of Burleigh Heads National Park. No waves of course and a nice spot for a swim, stand up paddle board or kayak. Burleigh Heads – voted #1 by travelers on Trip Advisor and is one of the best swimming, body boarding and surfing spots on the coast. The headland of Burleigh, known as “The Point”, is a favourite for weekend BBQs and sunset drinks. On a Sunday afternoon local musicians and fire-twirlers come out to the park beside the surf club for a jam session. Broadbeach – towards the northern end of the coast. Long, clean stretch of beach and bordered by large grasslands and a playground perfect for a picnic. Also home to weekend markets. From fashion to farmers markets, to art & craft, to music to everything in between. Now that we are living here, it will take us some time to explore them all – quality problem! They are all free to attend and quite often there are lots of free samples on offer, or bargains. We especially love farmers markets for stocking up on supplies for self-catering when having picnics and BBQ’s, or when staying in apartments with kitchens. As much as we love eating out, you can save a pretty penny preparing your own meals, and can be more relaxing with young kids. Burleigh Farmers Markets – Our local. 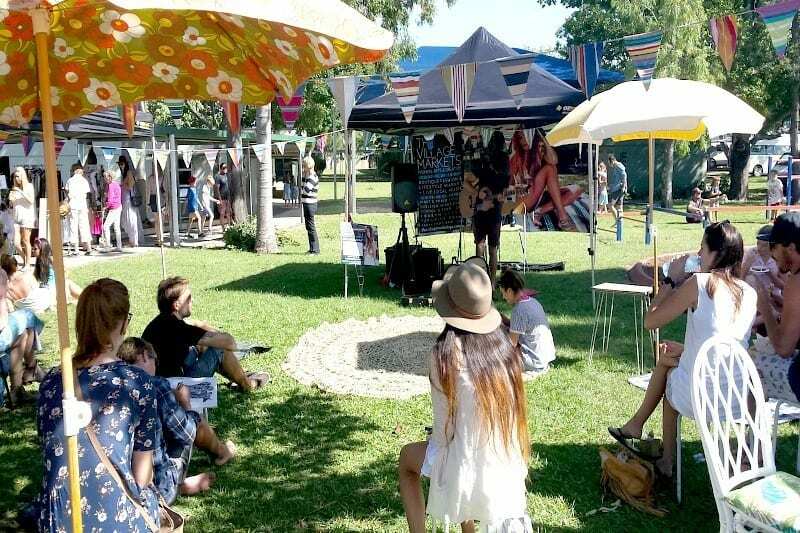 Every Saturday at Burleigh Heads State School this gourmet food market with locally grown fruit and vegetables, bakery, meat, fish, deli, plus live entertainment and a great vibe! Miami Marketta – Just discovered this locals favourite ourselves! Feels like we were back in Thailand. Every Friday and Saturday it comes alive with street food, live music, boutique wine and craft beer. Miami Farmers Market – every Sunday at the Miami State school. The area’s first truly Organic Growers Market straight from the farm. The Village Markets – every 1st & 3rd Sunday at Burleigh Heads State School. The original boutique fashion and lifestyle market plus live local music and food from around the world thanks to the lineup of food trucks. Having only lived on the Gold Coast for two months now we are constantly amazed at the quantity and quality of playgrounds and parks on offer. At almost every beach, or green space, there is a playground with picnic benches and BBQ’s. The council does such a great job of providing and maintaining these facilities for everyone to enjoy, and usually right on the beach. You can let the kids play on the equipment, kick a ball around, or just relax with a picnic or BBQ. And besides the cost of your BYO food and drink they’re all free! Paradise Point Parklands, one of the most beautiful parks on the Goldy overlooking the broadwater. Justins Park in Burleigh Heads, right on the beach next to the surf club. 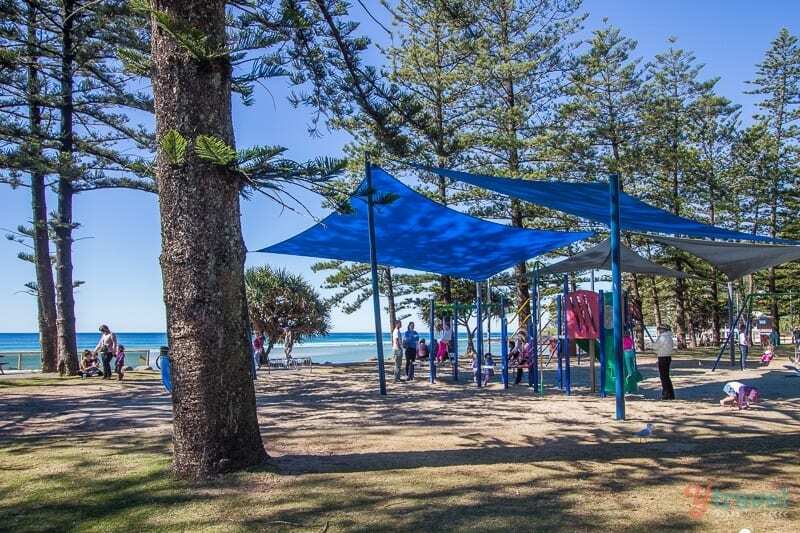 Pat Fagan Park in Coolangatta, right on the beach with views all the way to Surfers Paradise. Mcintosh Island Park, in the middle of Surfers Paradise. Laguna Park in Palm Beach, huge adventure playground with pirate ship. Kurrawa Pratten Park right in the heart of Broadbeach. Aquasplash, Australia’s first open water fun park, open Nov-Apr in Southport Broadwater Parklands. Broadwater Parklands, three kilometre stretch of parklands along the foreshore in Southport. Rockpools at Southport, extremely popular playground for young ones on a sunny day. There are several free events and festivals held throughout the year celebrating music, art, sports and our multicultural society. 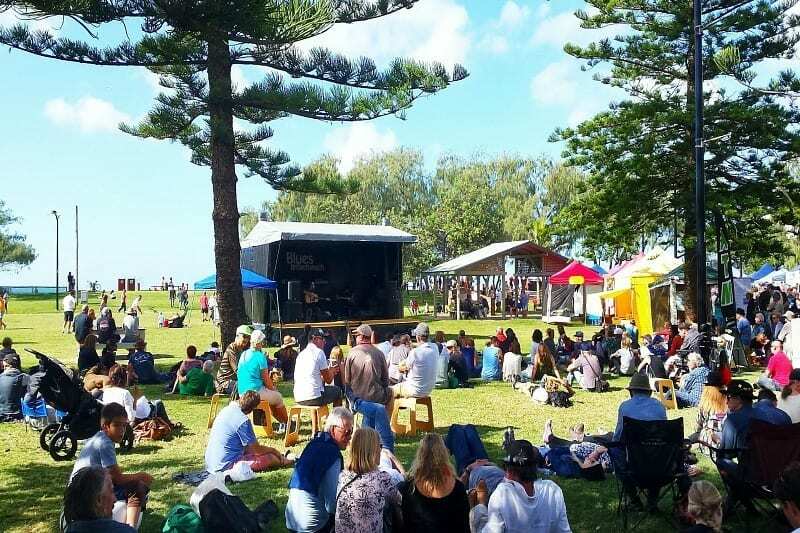 Blues on Broadbeach is held every year in May and is regarded as one of the world’s largest free festivals with multiple stages and shows spread over the four day period. It brings together the best blues and soul music from all over the country, nurturing Australian talent, as well as provides a stage for international acts. Cooly Rocks On is Australia’s largest 50’s & 60’s Nostalgia Festival held annually in Coolangatta celebrating Classic Cars, Rock ‘N Roll, Dancing, Surfing, Nostalgia and more! Cooly Rocks is a free event and open to all ages and in 2016 will be held from June 3-16. Swell Sculpture Festival at Currumbin Beach becomes home to dozens of sculptures by local, national and international artists. Over a 10 day period in September visitors can experience the sculptures for free on twilight walks and even talks from some of the artists. The Quiksilver Pro Surfing Event is your chance to watch the world’s best male and female surfers battle it out at one of the world’s best surfing spots, Snapper Rocks at Rainbow Bay in February / March each year. There’s also the Breaka Burleigh Pro in February. Bleach Festival is the Gold Coast’s largest arts and cultural Festival and coincides with the launch of the World Surfing Tour, the Quiksilver and Roxy Pro at Snapper Rocks in March. Over 50 events for all ages, over 17 days up and down the coast. Broadbeach Jazz Festival in August is another free event featuring entertainment on outdoor stages and in venues, along with an array of activities for people of all ages throughout Broadbeach. Sanctuary Cove International Boat Show – this 4 day event is now in its 27th year and attracts boating enthusiasts from around the globe. Next show is 19-22 May, 2016. Surfers Paradise Festival is one of the premier Gold Coast events and happens over the course of four weekends. It’s a celebration of art, culture, music and food and includes street parades and parties, concerts and a la carte in the park. Whale watching season typically runs from May to October when thousands of humpback whales migrate north from Antarctica, passing up and back down the coast. You don’t need to fork out big bucks to get a glimpse, you can try your luck for free from one of the elevated headlands along the coast, or even from your skyrise apartment, as whales have a tendency to come in quite close to shore. 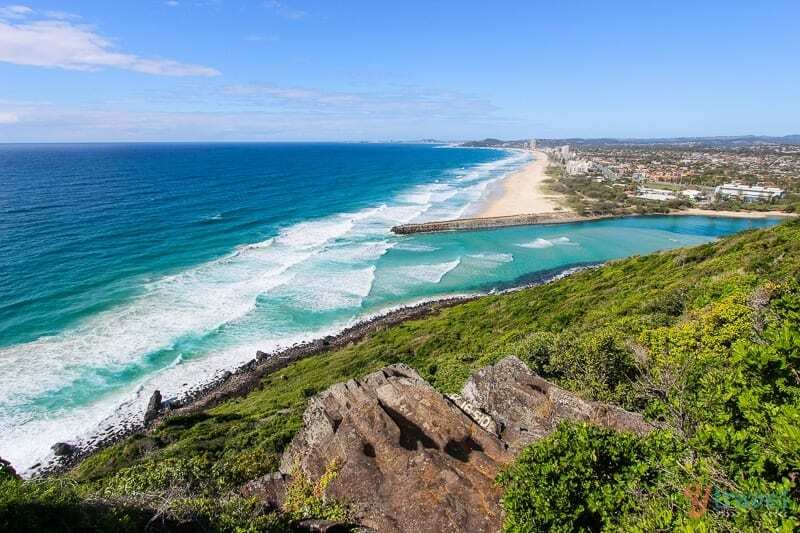 Some of the best naturally elevated viewpoints include Point Danger, Greenmount, Kirra Hill, Currumbin Rocks, Tumgun Lookout within Burleigh Heads National Park, North Burleigh/Miami headland. Look out for the big spouts of mist that shoot up into the air. Bring a zoom lens and maybe some binoculars! How about starting off your day the best way possible, by watching the sunrise over the ocean. Throw in the surfers doing their thing on the morning swell and you can sit and be mesmerized. Grab a smoothie or a coffee at one of the cafes and you’re ready for the day ahead. My favourite place to watch the sunrise and sunset is from Burleigh Point, just follow the path up the hill from the surf club. Also, the Rainbow Bay Surf Club is a great spot for sunset drinks as you watch the sky light up in the distance behind the Surfers Paradise skyline. This is on our must do list when the weather warms up again. 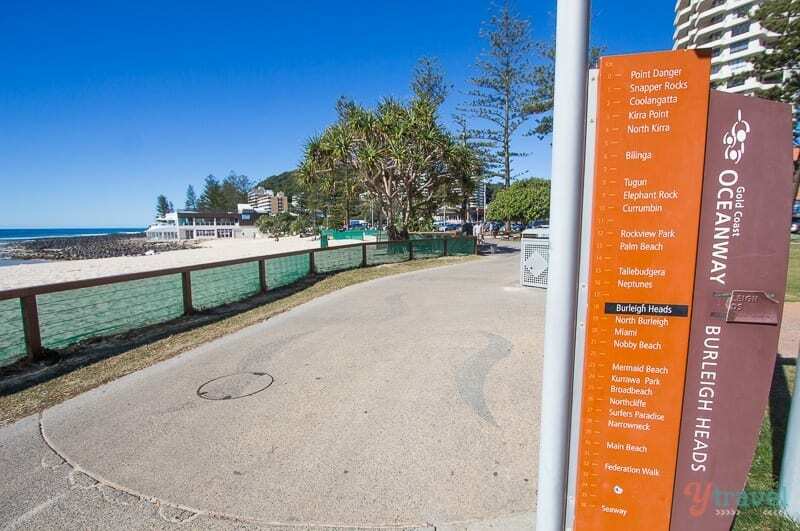 Apparently, the Rock Pools are just a 15-minute drive from Currumbin Beach, and are a favourite spot with the locals, and sound like the perfect area for a family day out with picnic tables, BBQs, grassy river banks, and toilets at close hand. There’s varying pool depths for everyone and rope swings, rock slides and ledges to jump off, and just another five minutes along Currumbin Creek Road is the Mount Cougal section of Springbrook National Park – looking forward to doing that800 metre walking trail to cascading waterfalls, more rock pools and an historic bush sawmill. Sounds like nature at its best! It’s not all just beaches and theme parks on the Gold Coast you know, the city is also famous for its glorious views as you’ve no doubt seen panorama shots on many postcards. We’re planning to head to all the best lookouts and incorporate a picnic or BBQ into the experience. The “Best of All’’ lookout at Mudgeeraba appears to be aptly named, and among the best lookouts. From Canyon Lookout in Springbrook National Park, they say you can see waterfalls and the main strip of the Gold Coast skyline off in the distance. Mt Tamborine comes highly recommended, offering sweeping coastal views, and of course, the previously mentioned Tumgun Lookout within Burleigh Heads NP is a must. We love the outdoors lifestyle on the Gold Coast, and how everyone is so active, it’s addictive. Ok, you’re probably on holidays and not wanting to workout, but if you like keeping up your level of fitness up and down the coast there are exercise machines and equipment that are free for everyone, plus the before mentioned walking and cycle routes. The City of Gold Coast created an Active & Healthy program to get residents and visitors up and working out, with several cheap classes on offer along the coast including circuits, boxing, core strengthening and stretching, and tai chi. Caz has participated in the bootcamp in Burleigh class held twice per week, for $3 a class, what great value. There are classes suitable for all ages and fitness levels and you can check out the class options and times here. We signed up for a membership of The Entertainment Book when we first arrived and have saved a few bucks on various activities. It’s a way to get up to 50% off and 2-for-1 offers for many of the best restaurants, attractions, hotels, travel, sporting events, shopping and much more. Once you purchase a membership, it’s a great way to help you save on activities. You can get a printed book, or do what we did and get the app on your phone. We’ve seen flights from Sydney to the Gold Coast for as little as $48 recently. The key to finding cheap flights anywhere is being flexible on your travel dates and the actual time of day you fly. If you can avoid the peak holiday periods and travel in the shoulder-season you can save a pretty penny. And let’s face it, the weather is almost always favourable on the Gold Coast. Keep your eyes on Jetstar’s Friday Fare Frenzy between 4-8pm on most Friday’s for your chance to snag a deal. 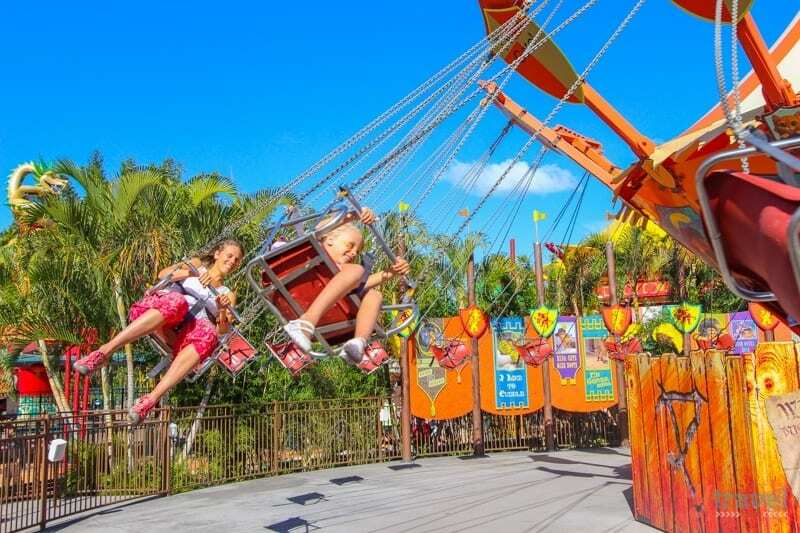 If you live local or visit the Goldy often enough and love getting your thrills at the theme parks, it makes sense to purchase an annual pass or holiday pass and get the best bang for your buck! That way you can visit unlimited times and have flexibility on which days you visit, avoiding the large crowd days.